So if you remember my Astrophotography Post from a few weeks back, I finally have a clear product to offer. For photography of the cosmos, the moon makes a relatively easy subject.Extremely large, with lots of sharp, fine details. Keep reading after the jump for a photo of the partial lunar eclipse from June 26, 2010 as well as information on how I managed to set these shots up. Firstly, these moon photos were made using my telescope using the least consistent, and cheapest way you can shoot through a telescope. I am awaiting more specialized equipment ordered online soon. 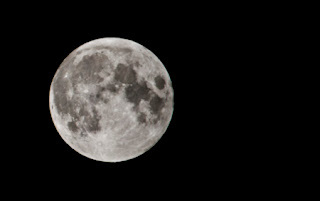 Anyone with a telescope and an SLR with Tripod can create a photo like this one. Set up your telescope where you will have a clear view of the moon. Remove eyepieces and accessories from your telescope. Remove the lens from your SLR and steady it on a tripod behind your telescope. Looking directly down the barrel of your telescope. (I was using a refractor) point it at the moon. It will not be sharp or in focus, but it will be very bright. This is a good starting position. Tighten everything on the telescope. Take a plain card and hold it behind the barrel you were just looking down. Slowly pull it back until the glowing circle that is the moon has sharp edges along the card. This is where your camera's sensor should be positioned. With your camera on the tripod with the sensor in the locaton the card just was, you can start to look through the viewfinder. You should have a relatively in focus image. Now fine tune it with little adjustments (very very gently!). Fire away. You will have no control of aperture. That will depend on your telescope. I was using ISO400 @ 1/125" on my Rebel XTi Body and a 470mm Bushnell Refractor Telescope with a 60mm diameter up front.Relatively basic in the way of telescopes for astrophotography. 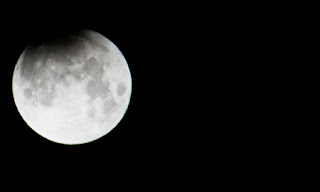 The second photo above was from the partial eclipse of the moon on June 26th, 2010. It was 340am PT when this photo was taken, and the eclipse had just started. Climax of 57% (shadow coverage) was not for another hour. So this was my last photo of the night. There is another eclipse visible in both North and South America coming later this year in December.